Cauliflower is a wonder veggie that really can be used in all kinds of dishes to add volume, fiber, and nutrients without a lot of calories. It’s also pretty easy to hide in dishes and fool unsuspecting veggie haters like kids and other random people. I’ve played around with Shrimp Fried Cauliflower Rice, General Tso’s Cauliflower, Barbecue Cauliflower Bites and more. Since heads of cauliflower are on sale now, I grabbed a few just because. I figured I’d find a way to use them later. LOL, a cauliflower impulse purchase. I decided last night to make a variation of tikka masala which is a spicy Indian curry. It’s a blend of hot pepper, creamy coconut milk, and tomatoes. I opted to make it with cauliflower for the base and bring the veggie front and center to keep calories down. I used almond milk instead of coconut milk to lower the fat content quite a bit from the usual version. Usually it’s served with chicken but you can really use any protein that you like. That makes it easy to use food that you’ve already prepped and keep meals fun. Make sure to check out the notes section after the recipe for tips on what I did. Preheat your oven to 425 degrees and cut the cauliflower into bite sized florets. Spread the florets in a single layer on a cookie sheet and roast at 425 degrees for about 25 minutes. The edges will begin to brown. Remove from oven. While the cauliflower is roasting, spray a large pot with non-stick spray and heat over medium heat. Add the onion and saute for about 5 minutes until it’s softened. Add the garlic and saute for about one minute to brown it slightly but not burn it. Add the spices, and stir to toast them for about 30 seconds. Add the tomatoes, tomato paste, almond milk, and lime juice. Stir to combine and scrap any browned bits off the bottom of the pan. Bring to a boil, lower heat, and simmer for about 15 minutes until the sauce starts to thicken slightly. Remove from heat and stir in the cilantro cubes or fresh cilantro. Toss the sauce with the roasted cauliflower and serve with rice or pitas. Makes 4 servings at approximately 89 calories each – 4g protein, 16g carbs, and 1g fat. You can use any meat or plant-based protein of choice here. Toss in grilled chicken strips, grilled steak strips or a vegan protein when you add the tomatoes and almond milk. That way the protein will heat in the sauce and be ready to go by the time the sauce is ready. I used almond milk instead of the traditional coconut milk since I don’t usually keep coconut milk on hand. You can sub in coconut milk if you prefer. I buy these VERY handy herb cubes in the frozen section at Trader Joe’s or Walmart. They come in a bunch of varieties like cilantro and basil, and they’re perfect for tossing in sauces like this and cut down on wasted herbs. I used the cilantro cubes here but you can also use fresh cilantro as indicated. 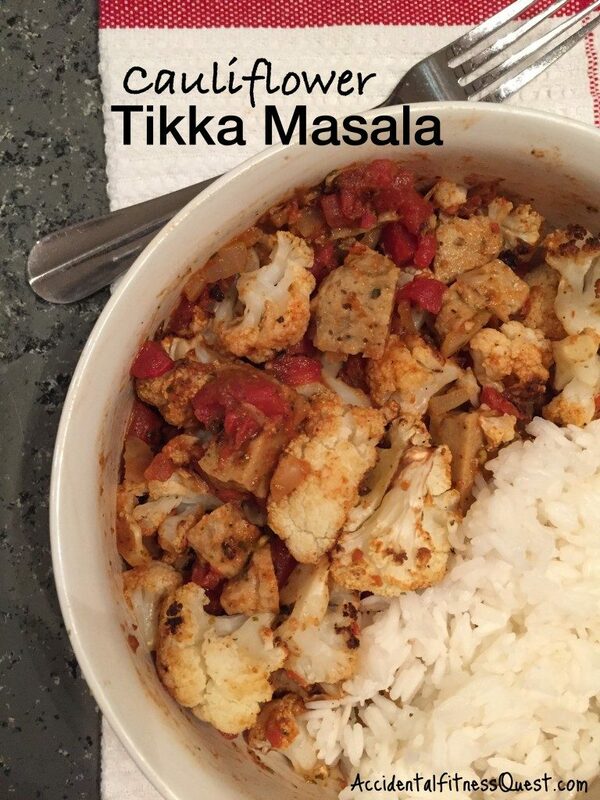 I served my tikka masala with jasmine rice since I always have prepped rice in the fridge or freezer, and I threw in grilled chicken strips. The total meal with chicken and rice came to just under 380 calories and tasted great. Have fun with your veggies and try them in new ways. If you’re interested in working with me to get meals together fast while working towards your health goals, I’d love to chat. Drop me an email, or come on over to Facebook and ask a question.